Indulge yourself, relax and unwind at Le Vieux Presbytère in the magical countryside of the Gers, South West France. Just 45 minutes west of the county town of Auch and 1 hr 30 mins hours west of Toulouse, Noulens is a sleepy village surrounded by vineyards and sunflowers with views to the Pyrénées. 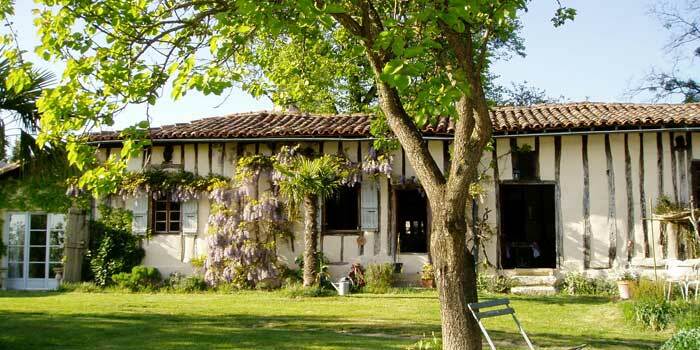 Capture the magic of Le Vieux Presbytère in one of the two self-contained holiday gites or the bed and breakfast. La Mouette sleeps 4 and L'Hérisson sleeps 2. Both have an abundance of light, open plan style, modern amenities and spacious mezzanine bedrooms with French country charm. Perfect for couples, families on holiday or people house hunting. L'Atelier, for bed and breakfast is a beautifully restored workshop, part of the main house with a private entrance and views to the pool and garden. This is the Armagnac producing area of the Gers with clear unpolluted skies, quiet roads, a temperate climate and fresh country produce. You can explore the pretty countryside with historical bastide villages or go for day trips to the Pyrénées or the long sandy beaches of the Atlantic coast. This is rural France at its best. Unspoilt and uncrowded, the Gers has a French charm all of its own. We believe every holiday, however long or short, should be special and memorable. "On returning once again we have experienced wonderful hospitality in such tranquil and beautiful surroundings".